Naialee Perez had just given birth to her first child, a baby boy named Liam, when a category five hurricane was making its way towards her hometown in the island of Puerto Rico. Liam was on a ventilator and undergoing treatment for a congenital heart defect in Hospital del Niño in San Juan while those on the island prepared for what would become one of the most catastrophic hurricanes in its history. Read this story. Meet our October Patient of the Month, Mariana. Mariana was born with Crouzon syndrome, a genetic disorder that prevents the skull from growing normally. For Mariana, it also caused difficulties with her breathing, but unfortunately, in Venezuela, where Mariana was born, they did not have the resources to treat her condition. Read this story. Gia was born with Vacterl syndrome when she was just 3 years old after her mother noticed blood in her urine. Soon after, Gia was diagnosed with a tumor in one of her kidneys. Originally from Jamaica, the family moved to South Florida to pursue treatment at Nicklaus Children's Hospital. Read this story. When he and his family were still living in Venezuela, Juan Pablo was diagnosed with stage 4 neuroblastoma, an aggressive type of cancer. 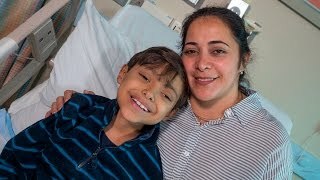 Watch Juan Pablo’s story and help us raise awareness throughout the month of September for Pediatric Cancer Awareness Month. Read this story. A surgical team led by Dr. Cathy Burnweit, Chief of Pediatric Surgery at MCH, performed a marathon 19-hour "heated chemotherapy" procedure that has only been used for pediatric patients at a handful of centers within the U.S., saving 12-year-old Daria Rozhkova. Read this story.